Duration increases with the player's INT, beneficial effect increase (like from Strand of Favor, which contradicts its description), and Power Level (if class ability). Damage the player takes increases with player's MIG, Power Level (if class ability), and all percent damage increases such as the human race bonus when bloodied or near death. Why does INT increase the duration of these harmful effects while RES simultaneously reduces it? Now we have two stats that the player wants to increase, both contradicting each other. INT should have no influence on duration, which will allow RES to do its job properly. The reason it works like this currently is that the game treats self-harming effects as both helpful and harmful. This should not be the case. On the other hand, ability self-damage should scale as the character becomes stronger to keep things balanced. All the abilities I mention below are relatively balanced to Power Level. Because self-damage is almost exclusively raw and all +% bonus damage increases will scale this damage up, it's easy to see that things can very quickly get out of hand. 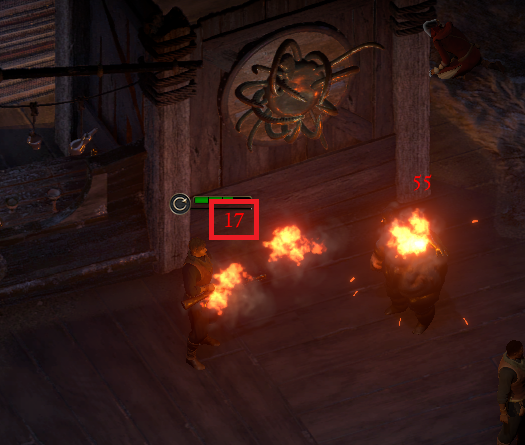 Forcing this self-damage to scale from Power Level only will allow DPS characters to use abilities like Frenzy and Sacred Immolation without having to compensate with high CON. Monk Forbidden Curse duration. Should be RES only. 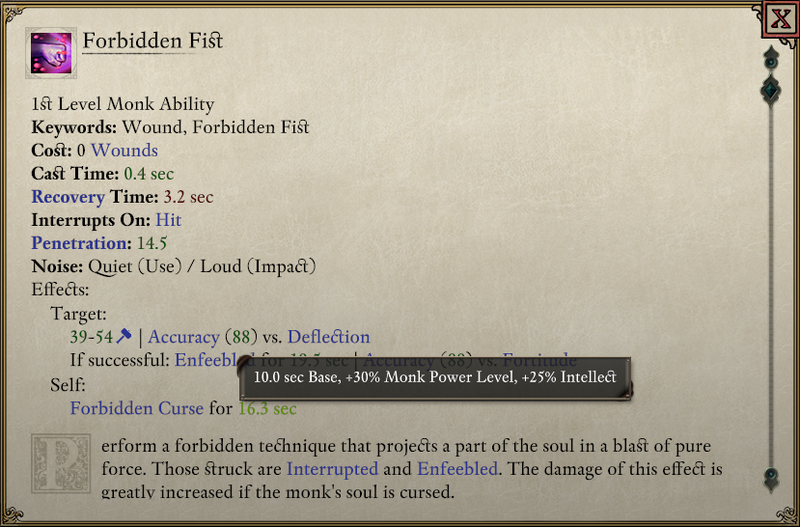 Monk Forbidden Curse damage tick. Should be PL only. Blood Mage's self-damage should be PL only. It's almost certainly being affected, but there's no tooltip and since it's random damage there's no way to prove it via screenshot. 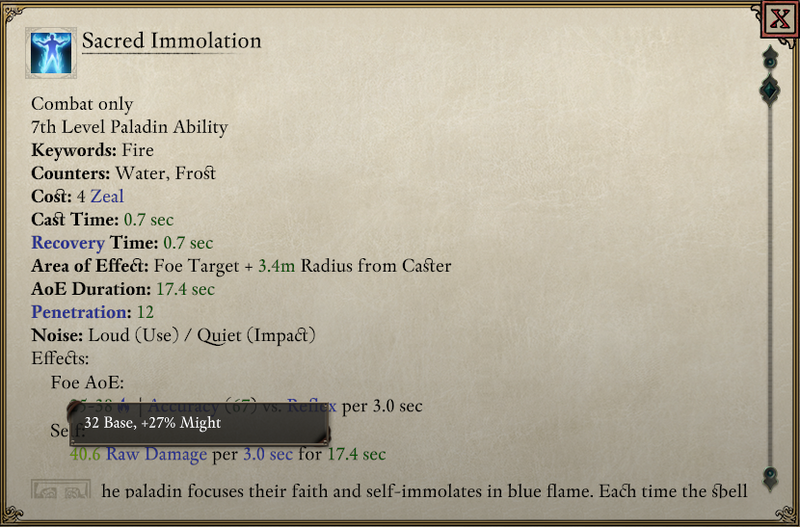 Paladin's Sacred Immolation damage tick. Should be PL only. 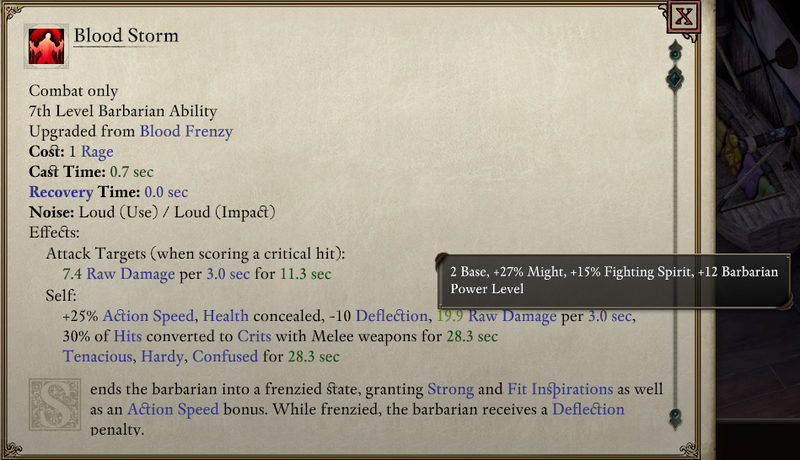 Barbarian's Frenzy damage tick. Should be PL only. 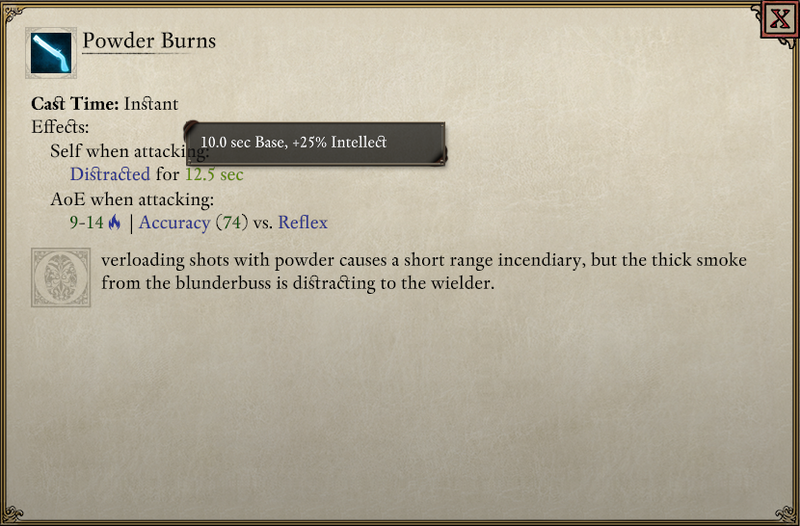 Blunderbuss's Powder Burns duration. Should be RES only. 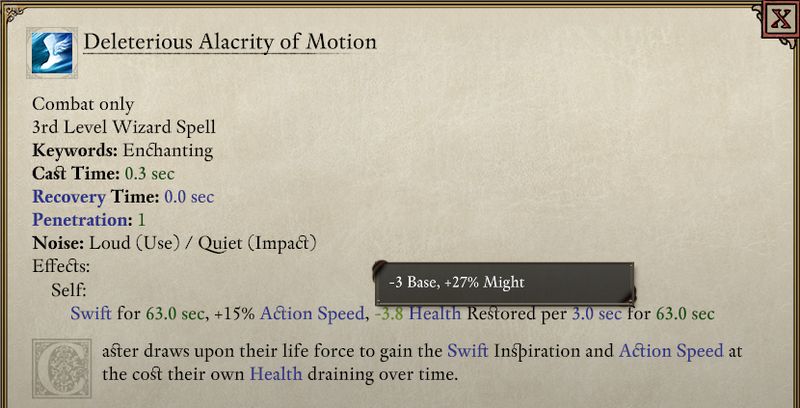 Wizard Spell Deleterious Alacrity of Motion. Should be PL only. Strand of Favor's passive effects both apply to self-inflicted effect duration. Only the Ward of Favor ability should apply. Fixing the scaling issues of harmful self-inflicted effects would be a strong improvement to combat overall. This will make the commonly ignored aspects of some classes and builds competitive, which would enhance the game's variety. Edited by DragonDrop, 11 April 2019 - 08:57 AM. In all cases of self damage Power Level increasess the base damage and high MIG will increase it further. That's why Berserker's Frenzy is so harmful at high levels. But in the other hand: if it wouldn't scale it would be totally neglectible after the early game - while the advantages would keep scaling up. In case of Forbidden Fist it's a big issue though. Edited by Boeroer, 20 January 2019 - 12:44 AM. if you increase atributtes and this scale up drawbacks - its' break gamedesigne decisions. because increasing atributtes basically give's you positive scale up in derived stats, like defences. in case what ts describe you have opposite effect. if drawbacks in some high lvl abilities to low, then we need increase drawbacks. but your stats still must have positive influence to correspond to general gamedesigne decisions. Edited by Ferion_Virian, 21 January 2019 - 02:08 AM. It seems the issue comes in two parts. First, there's the nonsense mechanic where increasing a beneficial stat makes negative effects stronger. But you're also right when you say the downsides would be negligible at higher levels without the proper scaling. A solution might be to make the damage you take based on your max or current HP so that the damage values have the same impact regardless of level and gear. They would of course have to be rescaled too, to make sure they aren't too strong or too weak. Edited by DragonDrop, 20 January 2019 - 05:33 AM. I would maybe just scale self damage with Powel Level and not MIG. Same with durations of other self-induced harmful effects (like Berserker's Confusion for example). That should do the trick. Scales properly with Power Level so it doesn't become meaningless - but removes the counterintuitive effect of "raising a stat does you harm". Revised list of effects to fix, and edited post for clarity and brevity. Wicked Beast spear self/ally damage. Damage shouldn't scale (or make PL only). Dragon's Dowry's 10 burn damage to wielder. Damage shouldn't scale (or make PL only). I will add more of these interactions to the thread as I discover them. Fixing the scaling issues of harmful self-inflicted effects would be a strong improvement to combat overall, and will make many unusable aspects of some classes and builds competitive. Came here from the forbidden fist bug thread. Honestly I think you're overstating the severity of the problem. While it is true that it is a slightly weird interaction that self-harm effects scale with both int (in the maleficent direction) and resolve (in the beneficent direction) this is a case where the game design benefits from the simplicity of being consistent with the existing rules of how intellect and resolve work. In addition, in many cases it can serve as a fun extra design space, where intellect and resolve act as an interesting tension for abilities that give you self-harm in exchange for longer or shorter benefits. Carving out exceptions for self-harm duration while retaining self-harm damage scaling just adds more cognitive load for people to try to have to pay attention to for such a limited/narrow set of cases and also pre-eliminates a possible design space. I think it's bad enough that Obsidian removed perception, intellect, and might influences on consumables (doing so creates odd interactions already), I would really hate for yet another set of carve out exceptions. 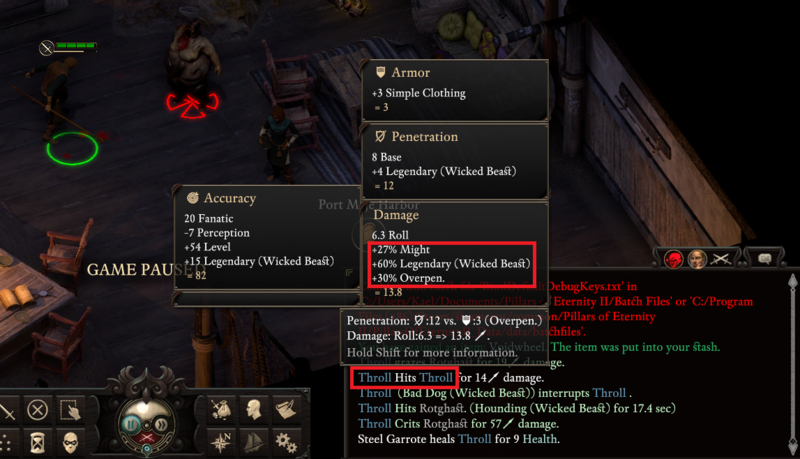 The issue with forbidden fist is that it's just a broken ability top to bottom, doing way too much damage (even without scaling) and having a flat +10s duration mechanic that ignoring any duration scaling is way too punishing for such a narrow benefit (on top of the class not having good way of generating wounds). It's independent of whether it disadvantageously "benefits" from intellect. Edited by thelee, 29 January 2019 - 10:34 AM. Honestly I think you're overstating the severity of the problem. While it is true that it is a slightly weird interaction that self-harm effects scale with both int (in the maleficent direction) and resolve (in the beneficent direction) this is a case where the game design benefits from the simplicity of being consistent with the existing rules of how intellect and resolve work. It's true, the scaling described is consistent. It's also true that no player expects things to work this way because it doesn't make sense. The bottom line is that the game treats self-inflicted effects as both helpful and harmful at the same time. This is the root issue I'm trying to bring to the surface. It's not a logical game mechanic, and was most likely not intended to be this way. It's also not simple because you need to consider more factors when figuring out how much damage you'll end up taking. I'm not arguing that these changes will automatically make Forbidden Fist viable. That class needs a lot of work. This will certainly help, though, in the same way that it will help many other classes and builds. Edited by DragonDrop, 29 January 2019 - 12:29 PM. That's a really great thread. I can hear the prayers of DPS Paladin lovers. I'd really love if they did. I know they're swamped with the bugs caused by the recent updates to the game. Patching this up would make combat cleaner and more logical, in addition to improving Forbidden Fist (which desperately needs improvement) and potentially Blood Mage too. Bump... hopefully support isn't still being swamped by the bugs caused by turn based mode. Edited by DragonDrop, 11 April 2019 - 08:51 AM.